small playground and showers are located at the beach. Close to Gunstock for winter skiing and tubing. Great family hill with a variety of trails for skiing and snow boarding and a variety of lifts. mile. Gunstock Mountain and Recreation Area is nine miles away. Guests please bring own linens and towels. We wanted a home we could use with our family in both summer and winter. This location has access to the lake, and it is close enough to Gunstock ski area in the winter. We bought this home when we were looking for a home we could use to vacation with our family. At the time we had small children and this home suited us great because it was close enough to the beach so we could walk down with the children. We could also use the home in the winter as the children learned to ski. As the kids got older having bedrooms on different floors allowed us to invite another family, but keep some privacy. The table has extra leaves so it can expand to comfortably seat 8. An additional chair can be brought to the table to easily seat 9. The television is a smart television so you can access your netflix account, amazon prime account or hulu account. Both upstairs bedrooms have a small balcony. Both are perfect for an early morning coffee. 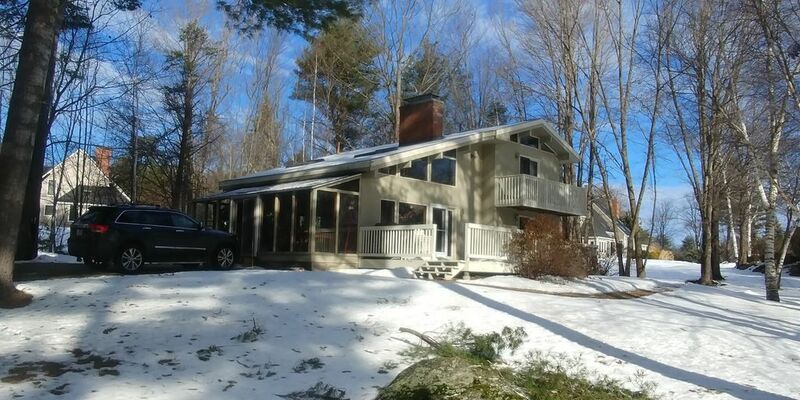 Beautiful home, close to the lake and Gunstock. Pictures don’t do it justice! Clean and had everything we needed. Owners were very easy to work with and very accommodating. Would definitely rent again. We rented the home last summer, and will be back again this summer. Clean comfortable home. House is close to the beach (really short walk) Great for my family and our friends. Owners were really easy to deal with. Looking forward to being there again in 2012. We are located on Paugus Bay, a part of Lake Winnipesaukee in Laconia NH. We are in a gated community which has its own beach. The home is a 15 minute drive to Weirs Beach in NH. There boat rentals within 15 minutes of the home. In the summer you can enjoy hiking and zip lining at Gunstock Mountain and in the winter you can ski, cross country ski and snow tube. A great year round vacation rental.